At White Hart Lane this Saturday lunch time, league leaders Chelsea will make the trip across London to face a Tottenham team who have won their last four Premiership encounters. The latest success for Andre Villas-Boas’ side came two weeks ago – prior to the international malaise – as they overcame Aston Villa 2-0 at home. Spurs did not open the scoring until after the break – which should not be a surprise, as they have not scored at home in the first 45 minutes of any game at the Lane so far this season – and when the goal did come, it was via a lucky deflection off the back of Steven Caulker’s heel from a Jermain Defoe shot. The win was confirmed by an Aaron Lennon goal, who has now scored 26 times for the club and, on each occasion he has found the net, Tottenham have not lost. One record was broken in that match however, as Hugo Lloris was selected ahead of Brad Friedel, ending the American goalkeeper’s 310 consecutive starts in the Premiership. While many were sad to see Friedel dropped, the French number 1 did register the club’s first clean sheet in the league of the season, even if he nearly gave away a goal with a poor throw out straight to Gabriel Agbonlahor at the start of the second-half. Villas-Boas failed to lead his new team to any wins in their first three matches and there were already questions about his ability to succeed in the city in which he failed last year, but with four straight wins and being unbeaten since the opening day, he can now look forward to the opportunity of getting one over on his former employers this weekend. The Chelsea team Tottenham will face on Saturday looks significantly different to the one that AVB was in charge of last season, mostly because of the addition Oscar and Eden Hazard to the squad. The two creative midfielders have helped propel their new club to the top of the table, with six wins and a draw from their opening seven matches, including a 4-1 victory over Norwich in their most recent fixture. John Terry will be absent for the visitors as he begins a four match ban after the FA found him guilty of racially abusing Anton Ferdinand in his team’s game against Queens Park Rangers last season. It is somewhat ironic that a game at White Hart Lane will the first of his suspension, as it was the site of his sending off for unexplained reasons (it is alleged he used racist language towards Ledley King) in Tottenham’s 2-1 triumph in 2006 which was their first over Chelsea in the league since 1990. Dating back to that victory, Spurs are unbeaten in their last six home Premiership encounters against the Blues and will be hoping to inflict the first defeat of the season on the current league leaders. Sunderland were the only team to take a point away from a trip to the Etihad last season, but in their match there a fortnight ago they became the first side who had failed to find the net against Manchester City in any competition this campaign. Mancini’s men ran out 3-0 winners, while their cross-city rivals, United, registered the same scoreline coupled with an impressive performance at St. James’s Park against Newcastle. Both Manchester clubs have taken 15 points from their first seven matches, four fewer than Chelsea and one more than Tottenham, Everton and West Brom. The Toffees earned a late draw against Wigan through a Leighton Baines penalty; while Albion beat Queens Park Rangers 3-2 at the Hawthorns, despite well taken goals from Adel Taraabt and Esteban Granero for the visitors. Liverpool were once again frustrated at home, as they were held to a 0-0 draw by Stoke, making it four league games without a win at Anfield so far this season. 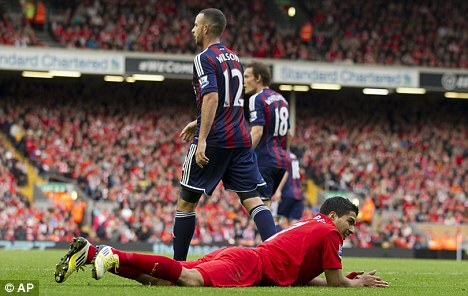 Their new manager, Brendan Rodgers came out in defence of his striker, Luis Suarez, despite the Uruguayan’s attempt to get a penalty with one of the more blatant dives of the season – it was so ridiculous it even outdid Gareth Bale’s own flop against Aston Villa (and, for that matter, Scotland in his game for Wales). Arsenal returned to winning ways in the East End of London against West Ham, beating Sam Allardyce’s men 3-1 with goals from Theo Walcott, Sani Cazorla, and a first in the Premiership from Olivier Giroud. Arsene Wenger will also be boosted by the return to fitness of midfielder Jack Wilshere, who he will be able to include in his squad this weekend for the first time in more than a season; although the Gunners’ manager will have to rely on third choice keeper, Vito Mannone, for the next two weeks, as both Lukasz Fabianski and Wojciech Szczeszny are injured. The other two fixtures from the last round of Premiership fixtures both ended 2-2 – Southampton earning the draw with a late equaliser against Fulham, though the Saints had led for the majority of the game; while Swansea came from two goals down at half-time to share the spoils and making Reading wait to find their first victory of the campaign. The Royals will try to get that win again this weekend, this time away at Anfield; Arsenal travel to Norwich; West Brom’s 100% home record will be tested by a visit from the champions, Manchester City; United host Stoke; and West Ham entertain Southampton, in a battle between two newly promoted clubs. Alongside the London derby between Spurs and Chelsea, there is also one in the North-East as Sunderland and Newcastle meet at the Stadium of Light; Wigan are in South Wales to play Swansea; QPR have a tough home match against Everton; and Aston Villa face Fulham at Craven Cottage.